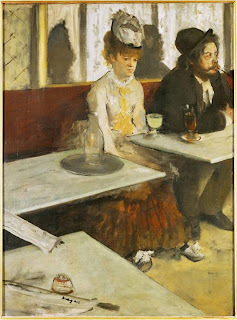 Here is a painting by Edgar Degas, which at first sight, seems to be a portrayal of another aspect of modernity - two individuals, sitting side by side, in a cafe, completely disconnected from one another, not communicating in any way, wallowing in their isolation. Typical of Impressionist paintings, it looks like a snapshot of a scene anyone might run into on the street, a slice of life. The subject is one impressionists are very interested in depicting, that of the urban lifestyle lived in the cafes. The influence of Japanese prints that Degas collected, can be seen in the placement of the table in the front, at an odd angle that is blocking the viewers way into the picture. The geometric shapes of the tables that lead us into the composition and the placement of the woman almost slightly off center can also be attributed to Japanese prints. The tables are actually geometric shapes that don't have legs with a folded newspaper forming a bridge between the two. Degas takes on the role of the artist/reporter observing the scene without making any kind of a moral commentary, he even signs his name on the newspaper with the baton, in the front. He gives us the life in the cafe as it is, noting problematic issues of the day along the way. The drink in front of the woman is known to be absinthe due to its light green color and the water jug sitting on the table next to her. 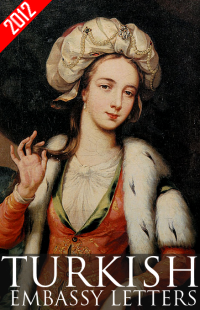 She looks frazzled, her shoulders stooped, her clothing and hat seem to be in disarray, her feet apart. Degas' use of brown and umber tones adds to her bedraggled appearance. A desolate figure, one of the lost souls who had no life outside of the cafe. The whole canvas is worked in earth tones with a muted, limited pallet adding to the sense of despair. Women at cafes and drinking was a big issue of the day and absinthe particularly was frowned upon and later prohibited because of it's hallucinogenic, addicting qualities. Emile Zola had written a story about a woman who became an alcoholic which horrified the public. The man leaning on the table completely oblivious to the woman, has a brown drink in a tall footed glass in front of him which was mazagran, a coffee that was drunk to cure a hangover. We can tell it is morning by the light entering form the right side, so they may have been here all night. Degas carefully composed this scene of real life and painted it in his studio with an actress and a bohemian artist from the Impressionists' circle posing for him as models. He got criticized for his use of recognizable individuals as degenerates and according to Musee d'Orsay's website he publicly had to declare that they were not alcoholics. There is a connection between this painting and the naturalism literary school, which Emile Zola was a part of. Zola started a serial publication, in the spring on 1876, of a scandalous novel about a laundress's slide into alcoholism.1 Both Degas and Zola were telling the dismaying stories of modern society. In a Cafe, is Degas' detached observation of a contemporary problem that started with the Second Empire in France.